News Alert: The Second Edition is now available! Get the AKF Partners blog content in your email! This book is much more than you may think it is. Scale is not just about designing Web sites that don't crash when lots of users show up. It is about designing your company so that it doesn't crash when your business needs to grow. These guys have been there on the front lines of some of the most successful Internet companies of our time, and they share the good, the bad, and the ugly about how to not just survive, but thrive. Abbott and Fisher have deep experiences with scale in both large and small enterprises. What.s unique about their approach to scalability is they start by focusing on the true foundation: people and process, without which true scalability cannot be built. Abbott and Fisher leverage their years of experience in a very accessible and practical approach to scalability that has been proven over time with their significant success. 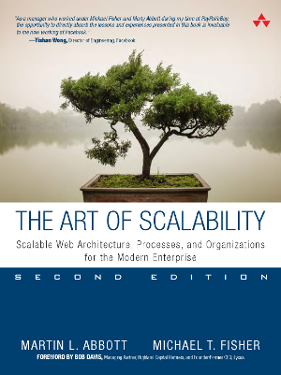 The Art of Scalability is by far the best book on scalability on the market today. The authors tackle the issues of scalability from processes, to people, to performance, to the highly technical. Whether your organization is just starting out and is defining processes as you go, or you are a mature organization, this is the ideal book to help you deal with scalability issues before, during, or after an incident. Having built several projects, programs, and companies from small to significant scale, I can honestly say I wish I had this book one, five, and ten years ago. — Jeremy Wright, CEO, b5media, Inc.
As a manager who worked under Michael Fisher and Marty Abbott during my time at PayPal/eBay, the opportunity to directly absorb the lessons and experiences presented in this book are invaluable to me now working at Facebook. If I wanted the best diagnoses for my health I would go to the Mayo Clinic. If I wanted the best diagnoses for my portfolio companies. performance and scalability I would call Martin and Michael. They have recommended solutions to performance and scalability issues that have saved some of my companies from a total rewrite of the system. A must read for anyone building a web service for the mass market. Martin L. Abbott, formerly COO of Quigo, spent nearly six years at eBay, most recently as SVP of Technology/CTO. He has held engineering, management, and executive positions at Gateway and Motorola. Michael T. Fisher, a veteran software and technology executive, spent two years as CTO of Quigo. Previously, as VP of Engineering & Architecture for PayPal, he led 200+ developers. Abbott and Fisher co-authored The Art of Scalability (Addison-Wesley). By the authors of The Art of Scalability informit. Thanks to Rich Kepenach for allowing us to use this draft syllabus (HTML) of his as an example. Here are the instructor's slides (4MB compressed PPT) containing all the diagrams from the book. Concepts from The Art of Scalability were presented at the Dutch PHP Conference by Lorenzo Alberton, a copy of his slides can be found here. You can also follow what's being Twittered about the book here. Chapter 19 Fast or Right?